I was recently invited to take part in a campaign entitled The She Word to celebrate International Women’s Day by featuring in a video about women in business which you can watch here, and dyeing my hair purple. 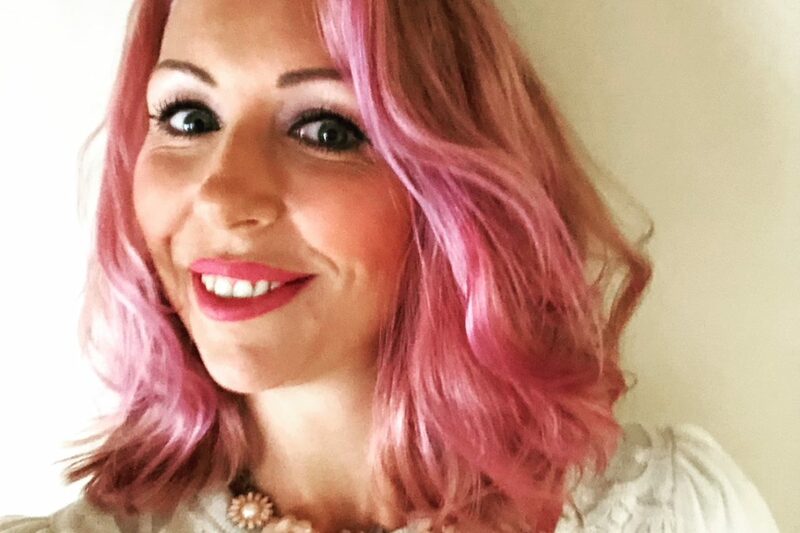 As regular Bird’s Eye Viewers will know, I’d never dyed my hair until last year (at 41; I know – late bloomer) when I finally took the plunge and went pink. Highlighter pen pink, to be exact. Hmmm. Luckily it faded very quickly. (You can see how it looked here.) Having arrived late to the hair dyeing party, I’m keen to make up for lost time and try out all of the colours of the rainbow, so when I was asked to dye my hair purple I was more than happy to oblige, and also got my nails done to match (well, in for a penny, in for a pound, eh?). “A passionate purple hue is set to top colour palettes in 2018, complementing the International Women’s Day #PressforProgress campaign theme, which highlights feminism and international efforts to achieve wide-scale gender parity. Purple is historically associated with efforts to achieve gender equality. In this context it was first used alongside green and white as the colours of the Women’s Social and Political Union, the organisation that led Britain’s women’s suffrage movement in the early 20th century. For suffragettes fighting for the right to vote, purple represented “the royal blood that flows in the veins of every suffragette,” according to the book Women’s Suffrage Memorabilia: An Illustrated Historical Study by Kenneth Florey. White represented purity and green represented hope. Cool, huh? I’m proud to be supporting IWD2018 and thankful to have been chosen for this campaign. I’m also thankful that the colour of gender equality isn’t orange. Fierce and feisty girl-about-town, with a straight-talking, no-messin' attitude. I tell it like it is, no holds barred, on my blogs, as a guest on various podcasts and over at Huffington Post UK where I'm a regular contributor. I'm passionate about raising awareness of gynae cancers and the importance of screening. Infertility and IVF are topics close to my heart and I run a support group called The Non-Mum Network on Facebook for childless women like myself.